The Karnemelkspruit is a stream with a reputation for producing unusually large rainbow trout. The river flows for 7 km through the property and you can enjoy fly fishing one of the best trout streams in the country. This water is strictly catch and release - no artificial lures, spinners or barbed hooks allowed. 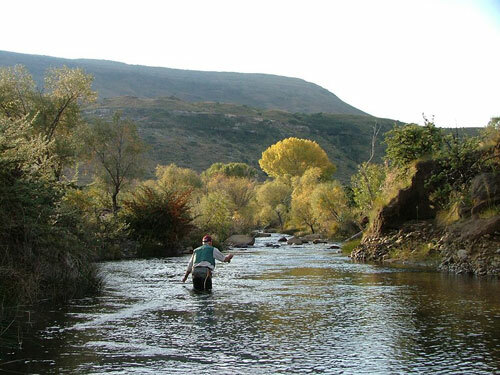 Trout was originally introduced to the Karnmelkspruit in the 1930’s. No stocking or feeding of fish - this is wild trout. "It is a stream that provides the adventurous fly fisher with diverse and challenging conditions" by Peter Brigg. Come and explore mountian country in the fresh alpine air. There is a large variety of hiking trails and paths for all levels of fitness, from slow winding paths along the river to steep mountain gradients above the kranse offering spectacular views of the valley and river below. Highlights of these hikes include small game on the property such as mountain and vaal rheebuck, blesbuck and a variety of the smaller buck species who roam the open veld. Explore the rock faces and overhangs which include some exceptional examples of rock art for the khoi san bushmen. Relax next to the river or cool off in refreshing mountain pools when hot and tired. Return to the comfort of your cottage after a day in the open air. A variety of plant species occur in this area. 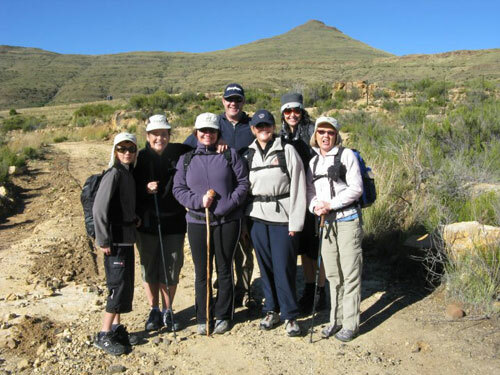 Explore the alpine flowers, fynbos and the medicinal plants of this area. Over 220 species of birds have been recorded in this area e.g. 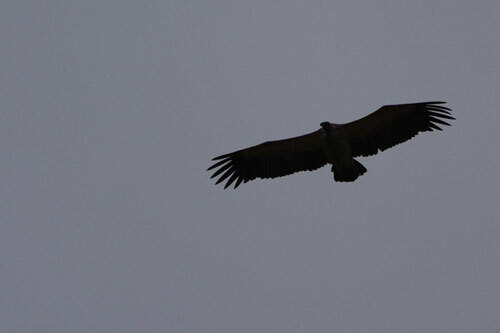 Lammergeier, Cape vulture, Gymnogene, Kingfisher etc. a comprehensive bird list is available at reception and the lodge. A fish eagle pair has decided to nest just below the lodge, affording the opportunity to sight and hear them on a daily basis. We are also involved in the protection of the Cape vulture and all the information on these wonderful birds available at the lodge and we organise your trip to this site on a neighboring farm. What a wonderful way to experience the countryside on one of the many cycling routes in the area. 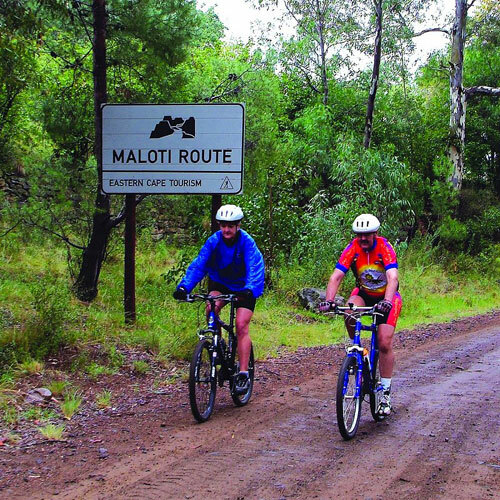 Do a route from the lodge up to Joubert's pass that will give you about 35km cycling trip and back, offering some magical views of the valleys and rolling mountians and Lady Grey. There is a variety of rock art on the farm, including rock art from the Khoi San bushmen, the Khoi Khoi and the early European settlers. Although not in pristine condition, it is still worth visiting as they are a unique feature of Southern Africa. Other rock art sites in the area can also be visited if arranged well in advance. 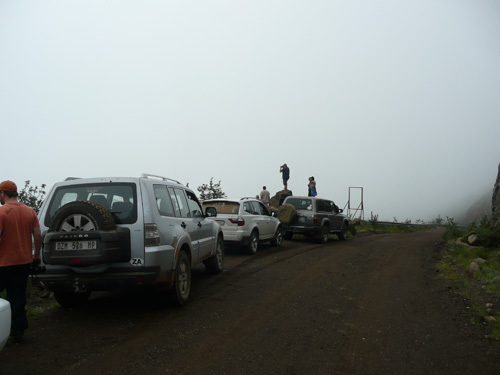 Featuring some of the highest dirt roads in South Africa, the 8 (eight) mountain passes of the North Eastern Cape provide travellers with the opportunity to test their grit, 4x4’s and nerves. The 8 mountain passes offer some fantastic views of the valleys and mountains of this unique area, from snowfall in the winter to rain drenched roads in the summer rain season, these passes offer any 4x4 enthusiast with a challenging yet very rewarding adventure. When cooking for yourself is not an option, let us spoil you with a home-cooked three coarse meal or a hearty farm breakfast with home baked bread. Picnic baskets are available for those days you just want to spend the day under a tree next to the river. This must be arranged in advance. This is a place to relax and to revitalise your soul. You will leave here a new person with new vision and peace in your heart. 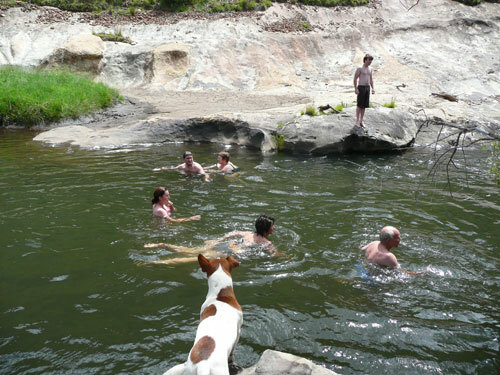 Crystal clear natural pools to swim, feel refreshed by the cold mountain stream. This is a working farm where we farm with cattle. You will experience the ordinary farm noises from cattle to tractors.